After a rainfall, stormwater runoff occurs. The storm water flows over non-porous surfaces like driveways, sidewalks, roofs and roads, and it is unable to seep into the ground. Ultimately, this unfiltered reaches the lakes, rivers, bays, creeks and eventually the oceans. It is also common for it to reach ground water. Ground water is water that is located under the surface of the Earth. While traveling from non-porous surfaces to drinking water supplies, stormwater can collect different types of pollution before reaching bodies of water. Debris, chemicals and dirt are just some elements of pollution that can be caught up in stormwater and transported through water flow into a lake or stream. These bodies of water are used for recreational activities like swimming, fishing and some of them are local supplies of drinking water for a community. 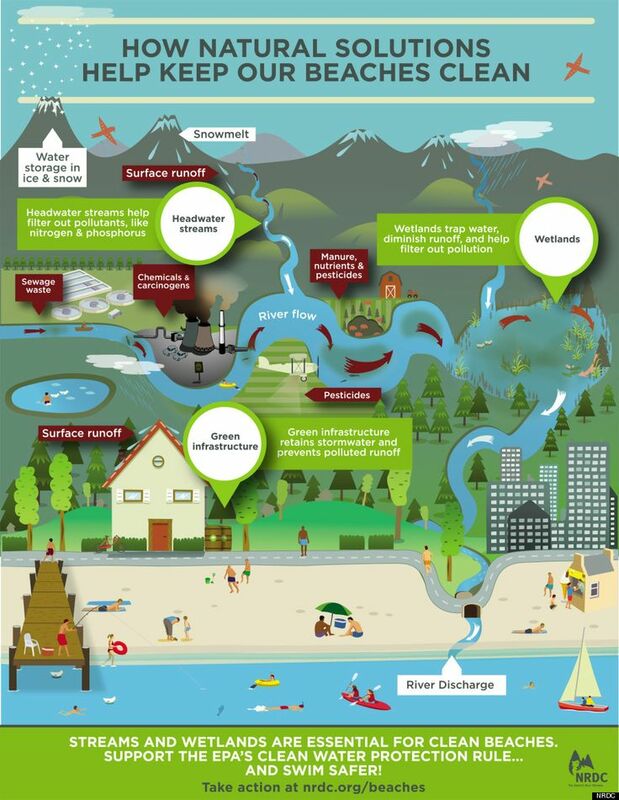 How Does Pollution Affect A Watershed? When it comes to stormwater, there are two different types of pollution. One type is point source, and the other type is non-point source. It is fairly simple to understand point source. This type of pollution can be easily identified back to the source. For example, if there is a broken pipe in a sewage plant, and raw sewage spills into a waterway, you can easily ‘point’ your finger at the sewage plant and know it was the source of the pollution. Although this type of pollution was very common years ago, stricter regulations has made it a rare occurrence with municipal water departments. On the other hand, non-point source pollution is not as easy to understand. The pollution in stormwater runoff is considered non-point source pollution. It cannot be traced to just one source, it comes from many different sources within the environment. In fact, this type of pollution is the largest source of pollution for watersheds. It occurs when small amounts of pollution from many sources is picked up by the runoff and then transported into a body of water like a lake or an ocean. Because the pollution comes from so many sources, it is challenging to trace it back to the original source. The runoff pollution comes from many sources, and it can affect watersheds in several ways. Sediment (sand, dirt and soil) can drastically increase cloudiness in water, and it can block the sun’s rays from reaching aquatic life in the ocean. It can prevent marine plants from growing, and without the plants, sea life will lose a valuable food source. This is where our SWPPPS can help you help the environment. When there are excess nutrients in stormwater runoff from pesticides, manure and fertilizers, the water supply can be negatively affected. The extra nutrients can cause bacterial and algal bloomsThese blooms reproduce quickly. This algae will also consume the oxygen in the water, and will increase cloudiness in the water. The aquatic life in the water will die because they need oxygen to live. Pathogenic bacteria and other microorganisms can also travel by stormwater into bodies of water that can cause health hazards and affect beaches and lakes. Cigarette butts, bottles and plastic can also interfere with marine life. Stormwater runoff is a serious environmental issue that is affecting the oceans and marine life. Everyone can work together to reduce the negative impacts by choosing eco-friendly solutions to save the planet. For more info please SWPPP California.